This book I have written is loosely based on my own experiences as an undiagnosed autistic. Please click here to read more about the book and to order a copy. 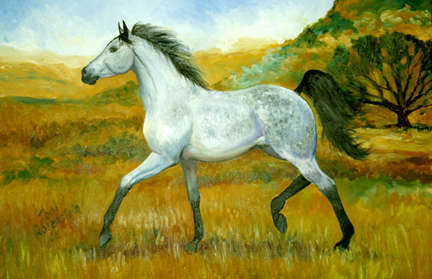 This is a dappled gray named Gay Neet, a champion Arabian. I painted him in the California foothills. "About my nom de plume, Toni Rosenstein and why I use that name to sign my paintings. My middle name, Antoinette, was my grandmother's first name. About two weeks prior to her death as she lay ill, I experienced what was for me a very touching moment when she asked me if I would forget her. "Of course not!" was my tearful reply, "I'll never forget you!" In memoriam I began signing all my artwork with her name, Toni Rosenstein. This is my small tribute to her and the wonderful memories she gave to all who knew her."